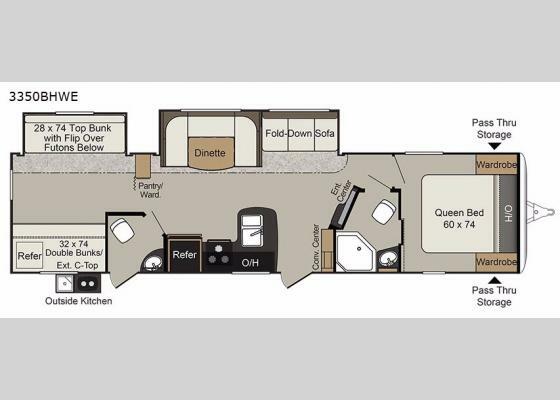 This Passport 3350BHWE Grand Touring travel trailer by Keystone RV features a rear bunkhouse for the kids, dual entry, a bath and a half, plus an outside kitchen to enjoy! Before entering this unit, check out the rear side exterior kitchen featuring countertop space, a refrigerator, plus a pull-out two burner cooktop and sink. The perfect camping accessory for those who enjoy cooking and dining outside! Step inside the main entry door to the kitchen and living combined area. A convenience center is on your right as well as an entertainment center. 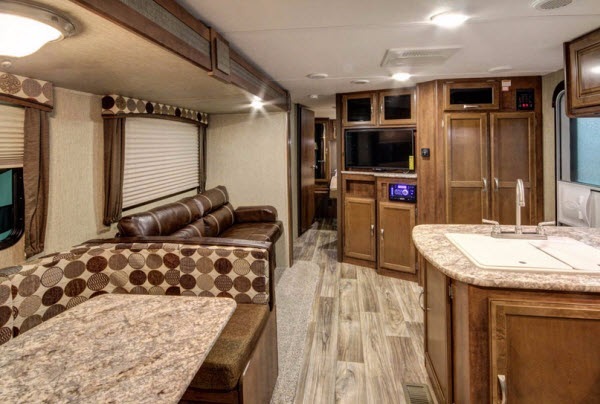 To your left you will find an L-shaped counter with a double kitchen sink, and a three burner range with overhead storage, plus a refrigerator can be found along the curb side wall. Dine comfortably on the slide out u-shaped dinette across the room with a fold down sofa that can easily be made into more sleeping space if needed at night. 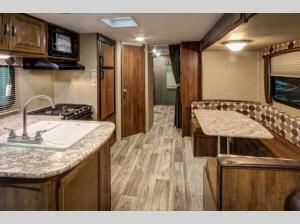 Head towards the front of the trailer where you will find a side aisle bath on your right. The full bath includes an angled shower, toilet, and sink, plus a sliding door into the bedroom. The front bedroom has a comfortable queen bed with wardrobes on both sides for storage, and there is additional overhead cabinets above the head of the bed. 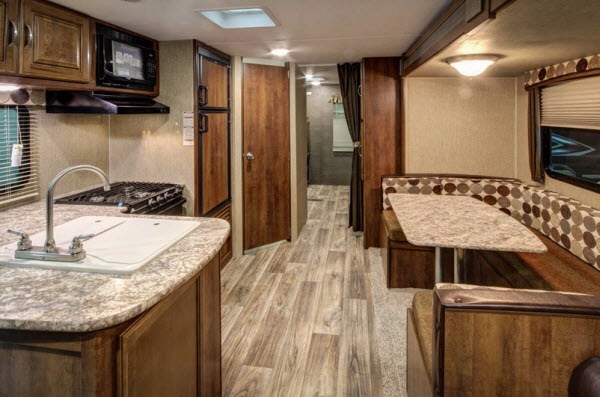 The rear of the unit features a bunkhouse for kids or extra guests. 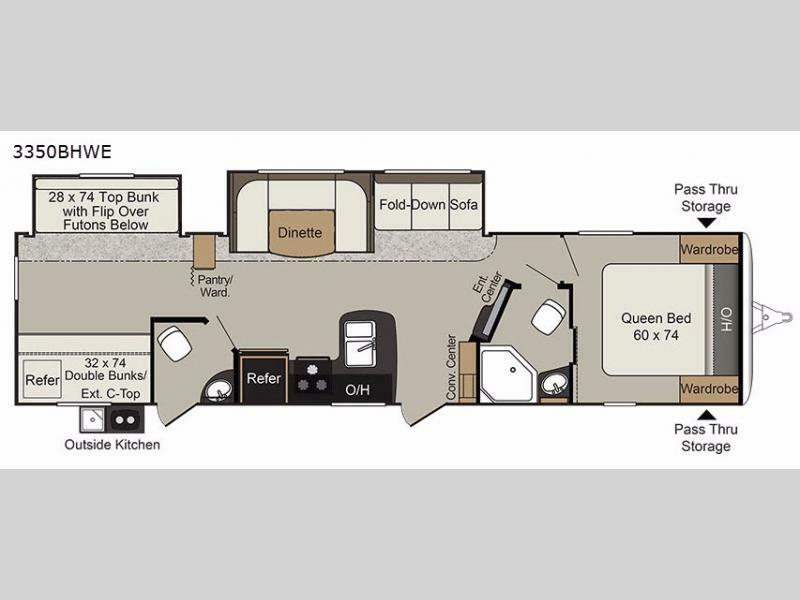 There are flip over futons that slide out with a 28" x 74" top bunk above. 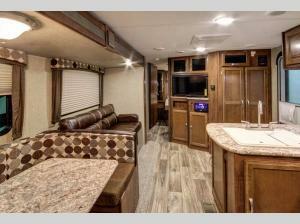 Across from those you will find a set of bunks that are 32" x 74". Next to the bunkhouse is a half bath with a toilet and sink, plus entry from the living area or from outside. A pantry/wardrobe is just across from the bath door to be utilized as you wish. Enjoy the exterior pass-through storage compartment for all of your outdoor camping gear, plus so much more!